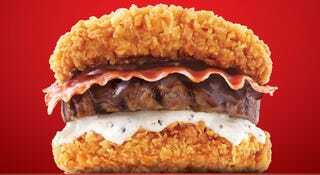 Foodbeast found a new KFC Double Down burger that is even more insane than the original: the Zinger Double Down King at KFCs in Korea. Instead of just sandwiching bacon and cheese with two fried chicken filets, this Double Down uses the same fried chicken for buns but adds a sauced up burger patty in between too. It is just crazy. I mean there are rules and lines and oh what the hell, the Double Down King is totally something I need to eat because it's the holy trinity of meats all in one bite: beef, pork and chicken are all represented here (you could even argue that they are all in their most delicious forms too: burger, bacon and fried chicken). Yum, indeed.